FeaturedCustomers Spotlights Close Management's Top Sentiment Rated Software of the Year. 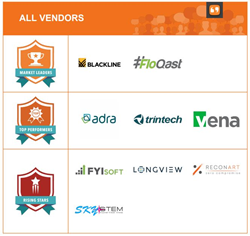 BlackLine Leads With Highest Overall Customer Success Scores. Today Featured Customers released 2017’s Fall Close Management Software Report to give company’s a better insight on which Close Management software works best for their business. BlackLine was crowned the Market Leader in the Fall report, scoring high across all 3 Sentiment Scores that make up the Overall Customer Success Scores. A vendor’s overall customer success score is reached via a weighted average of their Customer, Social, and Company Scores. The report is based on over 700 pieces of customer success content from verified users. Of the 10 products listed in Featured Customer’s Close Management category, the products ranked have received the review minimum needed, as well as sentiment score minimum to be considered for the report. FeaturedCustomers, the world’s leading customer success reference platform for B2B business software & services, helps potential B2B buyers research and discover business software & services through vendor validated customer success references content such as customer testimonials, success stories, case studies, and customer videos.